The Half Dragonfly Pose is a variation of the full Dragonfly Pose in Yin Yoga. The pose is a modification of the yang-style pose that we know as Upavista Konasana or the Seated Angle Pose. In Yin Yoga this may also be called the Half Straddle Pose. The goal of the practice of Yin Yoga, is exactly what the above quote describes. It provides us with a way to use long-held poses to see inwardly, to notice how and where we hold tension in our bodies. Once the body awareness is in our consciousness, we can learn to see how the opposite effect can be so therapeutic, when we release all our efforts on the musculature. As we hold a yin pose, and breathe deeply through the belly, we can observe the slow and subtle changes in the body as it shifts and releases, and therefore the power of understanding how we hold tension can be known. Tension is who we are, as a species, and the practice of Yin Yoga teaches us to understand this so we can know the difference between held tension and releasing tension in our bodies. This is the "work in" as described above. Because most of us have very tight groins, hamstrings and hips, which the Dragonfly Pose targets, the easier Half Dragonfly Pose makes the pose accessible to more of us. So do not be discouraged if you are unable to the the full Dragonfly pose. Practicing the Half Dragonfly Pose will give you as therapeutic an effect as the full Dragonfly. 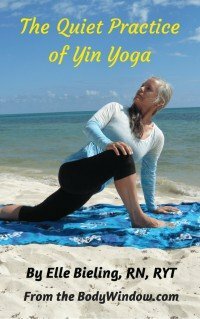 If you wish to learn more about the energetic benefits of this pose, click on this link to the Dragonfly Pose in a separate Yin Yoga page of mine. From a seated position, extend your left leg out to the side, as wide as is comfortable for you. Bend your right leg as shown in the photo below, bringing your right foot tight in toward your body. The Half Dragonfly Pose, although a modification, should still be able to give you a good stretch, by bringing you to a mild edge. If this modification is still too edgy for you, place a pillow or rolled up blanket under your left knee, especially if you feel any lower back pain or if you have sciatica. Make sure you find only a mild edge initially. You will know you are in a good place when you can still breath deeply and openly, yet feel a slight and interesting tug on your body that you know you can hold for more than a minute. You can always deepen the pose if needed later, as your joints slowly open. When you have found your mild edge in the sitting position, it's time to take it deeper. Slowly start to bend at the waist, (see next photo) as you shift your hips forward. Only bend forward enough to feel a mild pull in the groin. Do not force your torso or pull yourself forward in any way. If you find that you cannot bend forward very far, or not at all, that is OK. This is your pose for now. The goal is not to get your head on the ground as everybody believes, but to find the fullest expression of your unique pose. You want to come to your edge, without going over the edge! Breathe down and in, deeply into the belly. Send the oxygenated blood from your even and deep breathing, to the areas that are tugging, and invite your body to release. As you can see above, even though I know this pose very well I was stiff on this day (despite the warm sun on the beach in Playa del Carmen, Mexico) and got nowhere near the ground. If you are really tight through the hips and back, it may also be helpful for you to do this pose with your back up against a wall and just remain upright. Sometimes with the support of the wall, we can find more stability and alignment to hold a pose longer. You might find that when you root through the tailbone and lower back area against the wall, that you may find more space available to bend forward, with the added support. Intend to keep working on the opening, and after a few weeks, you will improve! But do be mindful that your body is in a different place from day to day. In order to keep your efforting at a minimum in the Half Dragonfly Pose and to maintain the ability to hold the pose for 5 minutes, it may serve you to drape your upper body over a pillow or yoga bolster. This is very freeing so you don't have to hold your upper body up at all, but can truly focus on breathing into the hips, lower back, groin and hamstrings. Now, as you release and relax into the pose, notice your body as it shifts over time. Resist the urge to fidget or squirm, but stay quiet and still. Hold this mild discomfort and notice your edge eventually move, so that you can go deeper still into the Half Dragonfly Pose as weight of your torso draws you downward. Come to your second edge, or third, as your body discovers that yielding is a wonderful feeling! If, however, you dislike this pose, and no yielding is forthcoming, then this pose is precisely the one you need to be doing! Remember to do the opposite side for equal amounts of time. Yin Yoga poses are active meditations, so quieting the mind is very important to obtain the desired therapeutic effects. Yet with contemplative yoga, you are also quieting the body, in spite of the edginess you feel. This is not easy! However, if you persist in the practice, you get dual therapeutic effects, of the body and mind, which in my humble opinion, is more than if you practiced stilling the mind alone. Becoming a proficient meditator in a Yin Yoga pose will assist you in holding discomfort in your life. Instead of bringing tension into your body when mental and emotional discomfort arises, you will be able to breath deeply and keep your body's subtle energy relaxed and open. This is Yin Yoga's life skill which will bring you great health and healing in your life as you become more skilled! The subtle energy of the body at the 1st and 2nd Chakra levels at the hips and groins are of a foundational nature and opening this energy area is a very grounding practice for you! The upright, Half Dragonfly Pose has become one of my favorite mediation poses. I even like to sit in this fashion, on my sofa when I am writing with my laptop on a TV table in front of me. Or when I am reading, or watching a show. It is a great cure for tight hip flexor muscles, and a wonderful antidote to sitting in an office chair all day. As the saying goes, "Sitting is the new smoking," so learning this pose and doing it on the floor or a sofa will help open tight hips from sitting all day. May you always be aware of your body and your breath and understand the impact of over-efforting. May you discover the difference between holding stress and tension, versus de-efforting, and the release of muscular tension in your body. The release is all in the breath. May you learn all of these things through the practice of the Half Dragonfly Pose, as you contemplate your own Body Window messages!